Little Ash is a lovely flint and brick cottage which has been completely renovated to a very high standard. The spacious cottage has two staircases, a large kitchen and is ideal for family holidays. It is situated within the coastal village of Brancaster, close to the childrens' playground and tennis courts. It is within walking distance of the beautiful sandy beach and the excellent Ship Hotel . The very popular Coasthopper bus stop is close by, as is access to the Coastal Path walk. The RSPB Titchwell Reserve is just over a mile away. Entrance into hall with Cloakroom: WC and hand basin. Kitchen: Really light and spacious room which has been extremely well-equipped with built-in dishwasher, fridge/freezer, double electric oven and microwave. Large pine table and 8 chairs. Utility Room: with Belfast sink and washing machine. Sitting Room: Large and comfortable with brick fireplace containing wood burning stove, sofa and armchairs, TV with Preview and Humax recording system and stereo. The main staircase (not steep) leads up from the sitting room. There is also a door to a second curved staircase leading into bedroom 2. Bedroom 1: Double bed, bedside table and lamp, chest of drawers, original beams and cast iron fireplace. Bedroom 2: Double bed, bedside table and lamp, chest of drawers. En-Suite Bathroom: with shower over, WC and hand basin. Bedroom 3: Single bed, chest of drawers and bedside lamp. Bedroom 4: Small single bedroom containing adult sized single bed with pitched ceiling. Travel cot available if required. Bathroom: Bath, WC and hand basin. A cot is available if required. Fully enclosed front garden which is part shingle and part paved, with parking for up to 2 cars. There is a dining patio table and four chairs, with additional chairs and a barbecue stored in the shed. 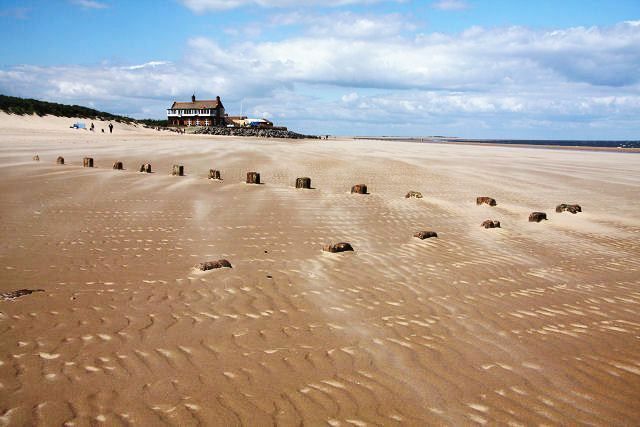 It is within walking distance to the coast at Brancaster and the excellent Ship Hotel. This is a great space, a home away from home. Very clean. Well maintained garden. Another great stay thank you! !